I haven’t been posting for a while. A … little thing happened to me that turned my world upside down. There’s many words you put to why … but lets just say, the Holy Spirit knocked me off my horse. I’ve been trying to blog about food and alternative, healthier ways of living, and I will continue to do so … but … I can’t do it anymore without mentioning Spiritual Food from time to time. I was studying Vipassina Buddhist Meditation (… be still and hear My Voice…) and then, like in every spiritual tradition I’ve attempted to undertake …. I “stopped too soon.” Initially I went deep, but after getting in touch with deep regions of my “Body-Mind”, I failed to get with a teacher or join a spiritual community (Sangha). The result of not changing? Well … you’ll never believe it unless you too know how Paul saw a bush on fire … a bush that only he could see … and the bush wasn’t consumed. That said, let’s get back to the reason for this post. At 6 feet 7 inches tall of urban Farmer Will Allen commands attention when he speaks. “The next generation of farmers aren’t going to come from rural family farms because those farms don’t exist anymore. 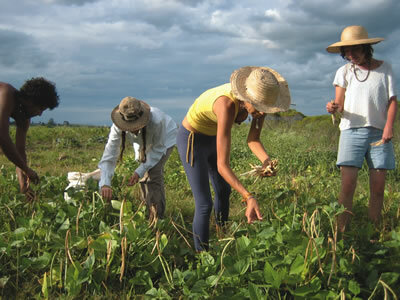 The next generation of farmers are going to come from the cities,” states Allen. When we think of the current economic crisis and the “fact” that jobs aren’t coming back the way they used to be before the housing bubble burst, one is faced with the frightening dilemma of actually being free. “Stop looking for a job and MAKE a job for yourself. That means doing what you love most … and what better cause than to “feed my sheep” or teach others how to create healthy food for themselves, how to commune cooperatively with greater quality of life. Will Allen grew up on a farm outside Washington, D.C., played professional basketball for a time after college, mostly in Europe. In 1993, he left a job with Procter & Gamble and bought a roadside farm in Milwaukee’s economically depressed north side — the last remaining registered farm in the city — and got local teenagers involved. Two years ago, the John D. and Catherine T. MacArthur Foundation “genius” grant. The grant recognizes Allen’s work bringing affordable fresh produce and quality grass-fed meats to the urban poor and educating communities about sustainable farming. The Chicago-based MacArthur Foundation awarded Allen $500,000 over the next five years to use however he wishes. 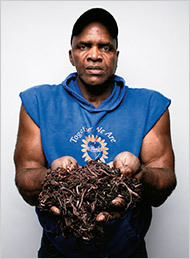 Allen, 60, also received $100,000 in 2005 from the Ford Foundation on behalf of urban farming work. co-founded Growing Power in 1993 in Milwaukee to help teach inner-city kids about the origins of their food. I haven’t been posting much lately. The reasons are many … but the main reason… is that I discovered time had run out on my dream of owning a farm. I’ve always been a very active guy with a lot of energy. But I’m 56 now and I have to be realistic. While growing fresh fruit and vegetables replenishes my body-mind, I have to ask myself, how much more manual labor do I want to do as I age? Urban Farming is more of a realistic goal for me now. There are so many ways to do it. There are even grants for it. The rewards can be as small as insuring the health of you and your family, to building a small cottage industry. Perhaps that’s another reason urban farming is so attractive … the reality that wherever there’s a problem, if you think a few steps past “the problem” and look for a solution, you can get paid! My only worry is that as we enter this newest period of “change”, huge, greedy corporations like Monsanto will be able to close the doors before the open. Obesity is the second greatest cause of cancer in the world today. The potatoes in your big chain grocery stores today have so much sugar in them, that you cannot even cook the same potato-based recipe that you could just 13 years ago! Think Genetically Modified Food is no problem? Tasteless tomatoes and other gas-ripened food that sit on selves like wax time bombs waiting for trusting, uninformed mouths to gobble them down … is that what you really want? Monsanto created Agent Orange! You know … the “herbicide” used in Vietnam that eventually killed thousands of former G.I.s who walked through the stuff? They didn’t even eat or drink that product and cancer ran rapid through their ranks. HOW in the world are we feeling so secure about eating yet another of their products simply because “they” put it on the local store self? 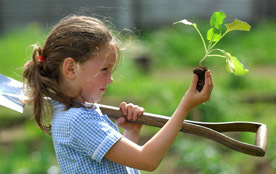 My Organic Acres promises to deliver you with fresh, organic produce that YOU CHOOSE. Plus, you can get more from other farmers and either sell at the Farmer’s Market of your choice or their, online Farmer’s Market. You can even donate the produce to the poor as a tax write off. Everything that initially looks bad … ain’t always bad. Sometimes it turns into a blessing. Take Cleveland for instance … read how yet another city is coming up with creative ways to solve their problems of declining quality of life (orignal story here). The City Council on Monday approved two measures aimed at reshaping the city’s urban landscape. In short, the Cleveland City government has realized it’s time to demolish abandoned homes and buildings and allow residents to grow their own food on the unused land. Decades of population drain, industrial death and, most recently, the foreclosure crisis have left about 3,300 vacant acres in the city, and at least 15,000 vacant buildings. The other ordinance sets guidelines for how Mayor Frank Jackson will spend $25.5 million in federal neighborhood improvements funds. The bulk of the money will be used to tear down abandoned homes left behind by the foreclosure epidemic. One ordinance will allow residents to raise and keep farm animals and bees. It’s a step, proponents believe, toward finding innovative uses for vacant land. “We want people to be able to grow their own food,” Cimperman said. “You don’t need a ton of infrastructure to produce food,” she said. “You need access to land, water, sun and know-how. That’s not a lot of barriers to entry compared to other start-ups,” said ordinance sponsor, Councilman Joe Cimperman. Here are two people who decided to do whatever they needed to do so they could do what they WANT to do. That means stepping out of the box, defining what their dream life really looks like, what is essential for them, and then partnering to get it done. North Carolina farmer Alex Hitt and his wife Betsy have worked their 26 acre farm in Graham, N.C. into an environmental gem and profit center. “Over the years, Hitt has reduced acreage and labor by improving their soil with cover crops, concentrating on high-value crops that grow well in the area. What he has not reduced is profit, thanks to direct marketing through the Caroboro Farmers Market and Weaver Street Market, a cooperative grocery store in the area. Alex and Betsy Hitt delivered the keynote address at the January 12-13, 2007 “Future Harvest Alliance Conference” in Hagerstown, Maryland. Learn more about this and other Future Harvest-CASA information on their website at: http:/www.futureharvestcasa.org/, or email: fhacasa@verizon.net.